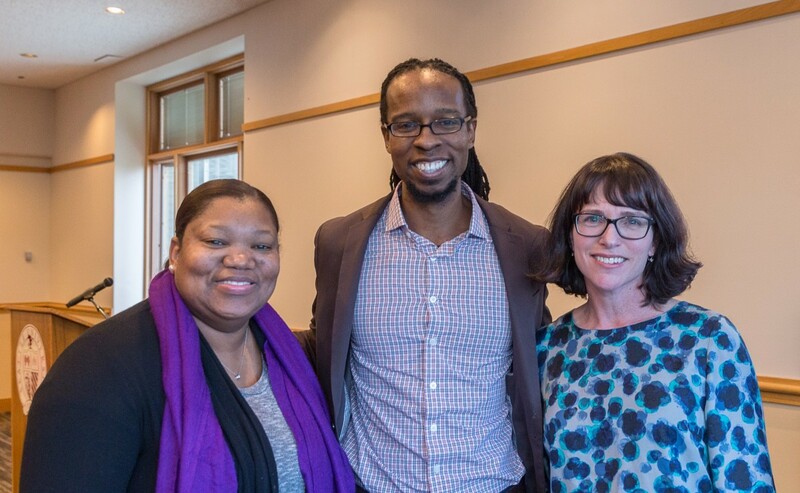 The Raikes Foundation was proud to sponsor Philanthropy Northwest’s community conversation featuring Dr. Ibram X. Kendi, National Book Award winning author of Stamped from the Beginning: The Definitive History of Racist Ideas in America. As a member of the Philanthropy Northwest board, I’m excited by the role Philanthropy Northwest is increasingly playing as a convener and resource to its membership on conversations about equity, particularly racial equity. So many of Philanthropy Northwest’s members are hungry for the space, tools and support to advance their efforts on diversity, equity and inclusion, in their own organizations as well as their grantmaking. Dr. Kendi's talk was the first in Philanthropy Northwest’s Equity Speaker Series that we have planned for the coming year. He set a high bar for future speakers. What is a racist policy? Dr. Kendi defined a racist policy as any policy that yields a racially unequal outcome regardless of the policy’s original intent. I think a lot about this in my work at the Raikes Foundation given our focus on addressing inequities in the systems that serve young people. As an example, think for a moment about the big and complicated system of public education. It is fraught with racist policies, from the fundamental mechanism by which schools are funded and the accessibility of college-level coursework, to teacher hiring policies and disciplinary policies, to name a few. There are countless examples where the intent of policy is not to disproportionately help or hurt certain groups of students. And yet, these same policies produce grossly unequal, racialized outcomes. What’s more, calling out policies as racist tends to put people, such as school leaders or policymakers, on the defense rather than inviting thoughtful dialogue and examination of the impact policies may have on certain groups of students. I’ve observed similar dynamics in other youth-serving systems where the Raikes Foundation funds. But if we can't call out the ways in which policies drive racially unequal outcomes, it will be hard to change policies and ensure more equitable outcomes for young people. According to Dr. Kendi, being a racist is not a fixed identity. Instead, it's what someone says or does in the moment. It's how you respond and the action you take. The transient nature of being racist—as defined by Dr. Kendi—doesn't mean that someone is not accountable for their actions and behavior. Instead, Dr. Kendi posits that a racist statement or action does not permanently define you. And with reflection and support, there is always an antiracist way forward. Dr. Kendi's definition has the potential to take the sting out of being called out as racist, creating more room for people to address their lack of knowledge, will or skill around racial equity. Among our staff at the Raikes Foundation, it's taken time, practice and a commitment to get more comfortable addressing our own biases, and examples of being racist. In the past, as a predominantly white organization, we spent a lot of time tip-toeing around the topic, partly out of fear of exposing our own racism. In addition, I came to learn that people of color on our team were frustrated by our failure to see race as central to our organization’s work, or to even talk honestly about it. The Raikes Foundation has begun to have more candid conversations about race and see more clearly how it connects to everything we do. Dr. Kendi’s notion of what it means to be a racist reminded me of a short video our team watched together—Jay Smooth’s How to Tell Someone They Sound Like a Racist. While the foundation still has a long way to go, we are spending less time being anxious and instead actively leaning into the difficult but important conversations about racism and its relationship to the change we wish to see in the world, and in our workplace. I know other local funders are in a similar space and on a similar journey to more explicitly "diagnose" the ways by which race impacts the issues we work on in our grantmaking, in our relationships with each other and in our organizational life. With Philanthropy Northwest’s new Commitment to Diversity, Equity and Inclusion (DEI), as well as a growing slate of DEI-related programs, Philanthropy Northwest can play a role in helping us have courageous conversations, be reflective and take the antiracist action we need to take to be more effective grantmakers. I look forward to engaging in this work with more of you. Board members Erin Kahn and C'Ardiss "CC" Gardner Gleser meet Dr. Ibram X. Kendi ©Philanthropy Northwest/Daniel Sheehan. 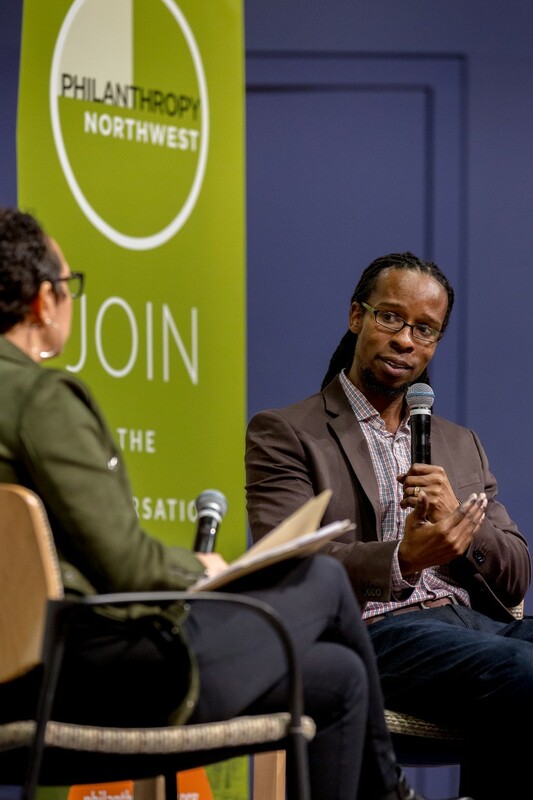 Dr. Ibram X. Kendi speaks with our Learning Strategy Director Maya Sandifor ©Philanthropy Northwest/Daniel Sheehan.